The energies have shifted yet again, growing more intense for many. There has been a consistent request by our Higher Teams to unify our consciousness – in an active, present way – to create stability as the incoming light grows increasing stronger. In brief, we are using the cosmic alignments to receive some very strong frequencies which push the envelope for our evolution and advancement. Why are they requesting this now? Rather than dwell on what they are doing to the body, the focus goes to consciousness itself. This is a passage of redesign, reevaluation, and recreating ourselves in alignment with everything we have learned from a year of cave time. As we inventory our own process, revisit our practices and comfort ourselves with spiritual empowerment, the Higher Realms are telling us to unify in this light in order to stabilize the collective consciousness and assist it to receiving the greatest possible acceleration. Fortunately there are enough of us who know how to be present in Unconditional Divine Love, Divine Neutrality, and expand our energy fields to call in light. There is great power in collective triggers – those passages when several souls enter the peace, the stillness, at the same moment in order to open channels for our Higher Realms to take command. 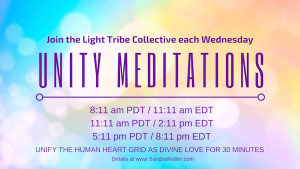 We provide three opportunities each Wednesday in May to create collective triggers and assist the calling forth of the highest Ascension timelines as a collective. If you are available, we ask that you join us. There have been reports of spontaneous healings, activations and a deep sense of peace during the meditations. Gatekeepers are holding the doorways open during these passages in order to assist your Ascension. While there are many more than 144,000 Masters incarnated right now, a Christed embodiment of 144,000 is set as a possibility to unfold this year. That will send energetic ripples through the HUman heart grid. That is the goal. However, if the energies create too much of a split in timelines (very High-vibe vs very low) we will be faced with a division. That is still a possibility, even with our highest intentions to get everyone on board. Remember the waves this year are the setup for 2017’s uber-blasts, and they are happening now; pushing the collective into action, higher consciousness, and our evolution of consciousness. Uncomplimentary programs might make it feel crippling or isolating; that is a misinterpretation of what the energy is meant to do. Open up; remember you are so much larger than the form. 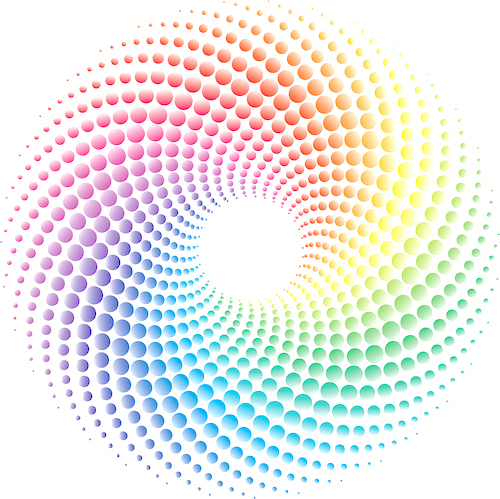 The redesign and reevaluation phase takes participation, as does unity consciousness. Therefore once a week, we are experimenting with our new collective influence. Not by forcing an agenda, just by being present and expanding into our Christed Self. Gratitude to those who do this daily already; let us witness what we may accomplish together. Let us utilize our collective HUman Heart Grid for the acceleration of healing, clearing, empowerment, and our embodiment of Unity Consciousness. 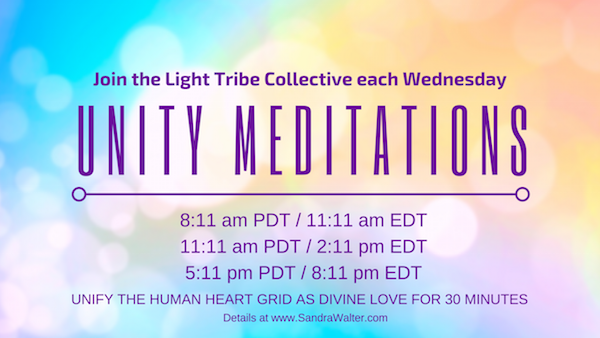 Please join the Light Tribe on Wednesdays as we unify as One Heart in Divine Love. Your Higher, Christed Self will work through you, through us; just let the Presence take over during these windows. Join from wherever you are, during these times if you are able. Three 30-minute windows: 8:11am PDT, 11:11 am PDT, and 5:11pm PDT. Connect with the HUman Heart Grid, Gaia’s crystalline core, the Crystalline Grid, SUN, and Great Central Sun. Be outside on Gaia if possible with your crystals. Gatekeepers, you know what to do – treat it like a Gateway. Stillness is Golden; focus on Pure Source embodiment, or use the guided Christ Light Activation meditation for expansion (on youtube or via free download below). It is an energetically strong year and we are doing great! Let us unite in peace with the intention to assist all beings embracing Unity/Christ Consciousness. So be it. Thank you, I Love You, I Bless You.